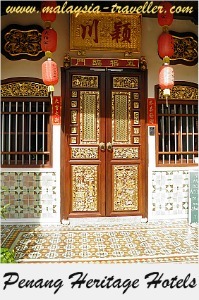 Looking for Penang Heritage Hotels? Here are Ten of the Best! Planning to visit Penang? Why not stay in one of these Penang Heritage Hotels? If you are looking to spend a lot of time on the beach then it would be better for you to stay in Batu Feringgi. There are plenty of good hotels on that beach to choose from. I have stayed in Rasa Sayang and Golden Sands and they are both excellent hotels. On the other hand if you want to spend more of your time exploring the UNESCO World Heritage city of George Town (and if you Googled this page I guess you are) then I recommend you stay in one of the Penang heritage hotels listed below. By staying in a heritage hotel you will be helping to conserve the historic city because unless owners can make money from heritage buildings they will have no interest in maintaining them and they will be left to crumble. Fortunately, since George Town attained UNESCO World Heritage status in 2008, a number of the city's old buildings have been restored and converted into hotels so there is a lot of choice. Here are my suggested Top Ten Penang Heritage Hotels in no particular order. I would be happy to stay in any of these on my next visit to Penang. To check availability and room rates for your chosen hotel in George Town you can look on Agoda's website here. The grand old lady of Penang heritage hotels has to be the Eastern & Oriental, George Town's most famous and prestigious hotel. The E&O has a long history having been established in 1885 by a family of Armenian brothers, the Sarkies, who also were responsible for The Raffles in Singapore and The Strand in Rangoon. The hotel has witnessed all the major events in Penang's history from British colonial days up the present time. Anyone rich and famous visiting Penang would naturally have stayed at the Eastern & Oriental Hotel. Since I am neither rich nor famous, I have not yet had the pleasure of staying in this hotel (a bit above my normal budget!) but I have visited the bar and some of the public areas and can confirm it is rather nice. For more details please check the E&O's website. 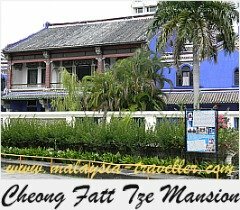 The Cheong Fatt Tze Mansion had fallen into disrepair over many decades until it was meticulously and expensively restored in the 1990s to become both a unique hotel and a popular tourist attraction. Also known as the 'Blue Mansion', construction of this house began in the 1880s. It is a Chinese courtyard home but incorporating influences and materials from Europe and other parts of the world. It has appeared in numerous films and TV programmes. It has 38 rooms, all different and individually decorated. To learn more please see their website. 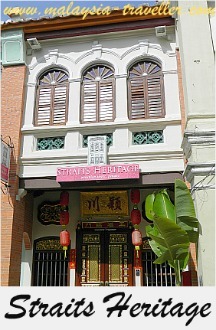 Straits Heritage, located at 92 Armenian Street in the heart of the historic core of George Town, is a tiny boutique hotel in a beautifully restored Peranakan style shophouse. It only has two suites, the Peony which can accommodate a family with a master double bed and an attached attic with two singles, and the Phoenix which has a king size bed. The hotel is tastefully decorated with authentic furniture to match the building. For more details refer to their website. This is another nicely restored building in Jalan Burma. Their website reads "1926 Heritage Hotel aims to bring you the wholesome [sic] of the British colonial era and the spirit of Malaysian hospitality ...". We get the idea. The hotel's rooms are less expensive than some of the others on this list. My son stayed there with some fellow students and said it was fine. More details on their website. Another boutique hotel in a nicely restored and conserved colonial bungalow from the Edwardian era. It has just six suites where guests can luxuriate in elegant and traditional surroundings. For details please see their website. This boutique accommodation was by the same designer as Clove Hall. Muntri Mews provides 9 rooms in a converted stable/carriage garage block. It is in a great location and the rooms have a clean, modern and stylish look. Their website can be found here. In a restored corner block of shophouses in Campbell Street, this small 10 suite hotel offers attractive accommodation and, unusually, an Italian restaurant (I believe the owner is Italian). See their website for details. This is another heritage boutique hotel in a newly upgraded and conserved 19th century building which was once a private residence in the central location of Chulia Street. It has 20 guest rooms which have been decorated and furnished to a high standard. More details on their website. Last but not least, the slightly larger Hotel Penaga has 45 guest rooms in their property which has been lovingly created by the owners from a hotchpotch of old shophouses and out buildings. The hotel is filled with original pieces by artists who take advantage of the Artist's Residency programme which is made available on the premises to aspiring artists from around the world. A variety of accommodation is available including two-bedroom units suitable for families. Even family pets can be accommodated with prior arrangement (a rarity in Malaysian hotels!). Refer to their website for more information. 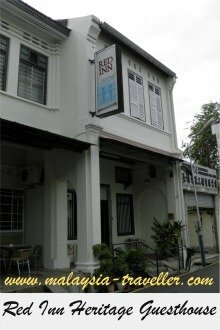 I hope this list of Penang Heritage Hotels will help you to make your mind up. Before deciding it is worth checking reviews from previous guests on websites like Agoda or Trip Advisor. These websites, through their bulk purchasing power, may also be able to offer discounted rates better than the rates quoted when you approach the hotels directly. To check the rates offered by Agoda please click here.